Teddy, the Elk that Kills! “WE ET HIM” an old timer’s reply to the question about the mounted elk of Ashland Lodge No. 944. Teddy, a 7 point elk, has been a part of, and has graced Ashland Lodge since 1936, and is a story all his own. Teddy was purchased from a California game farm by a group of Elks and presented to the City of Ashland. The city kept him in a pen in the zoo at the upper end of Lithia Park. Over the years he became quite an attraction and drew many visitors to the zoo. As old age started to catch up with him, he started to turn mean. It was then decided that Teddy should live out his remaining days in the wild. He was taken to Ashland Gap and released. But, as the story goes, the wilds were not to his liking and he was waiting for his benefactors at the pen gate when they returned to town. Teddy was given back to the Ashland Lodge after he turned on the zoo keeper [Rolland Jordan] and inflicted injuries that led to the man’s death. Teddy was taken to the old abattoir on Oak St. and was humanely killed. After his death he was stuffed and mounted. His meat provided the Brothers with four big barbecue banquets that year. Since his death, Teddy has been on display in the Ashland lodge. He survived the 1968 fire and was the center piece of the Ashland Elks float in the 4th of July parade of 1978. Teddy Roosevelt, the grand old man of Lithia park’s animal life, died Thursday afternoon, a bullet hole piercing his well preserved hide. 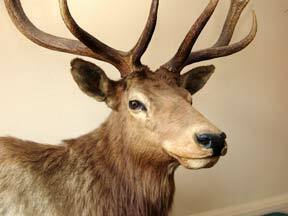 The big elk, who would have been 14 years old next summer, will be stuffed, all of him, and will grace the clubrooms of the Ashland Elks lodge. The life span of the elk, or wapiti, is between 12 and 15 years, and the lodge, which owned him, wanted to preserve his living majesty before the grim reaper took him first and rendered his carcass unfit for the taxidermist. The merciful execution was set for 1 p.m. Thursday afternoon and was to be carried out under the supervision of the Mr. Cummings of the Cummings Fir [sic] Shop in Klamath Falls, which will stuff him. Petersen’s market, in Ashland, will butcher the elk, preserving his exterior for mounting. The animal was named after the 26th president of the United States, who preceded him in death by three years. Teddy was born in Lithia park on July 8, 1922, and has lived in captivity ever since. I would like to thank those members who helped with information about Teddy: Corky Johnson, Margaret & Harry Hoxie, and Parker Hess. We now know the name of the caretaker of the Park was Rolland Jordan. Also to Bill Elhart, who gave us the Jan. 10, 1936 issue of the Tidings.